The band’s 13th studio set will be released in May, with the lead single, “Shut Up & Kiss Me”, issued in advance; further details are expected in the coming months. Leader David Coverdale and the band – which includes guitarists Reb Beach and Joel Hoekstra, bassist Michael Devin, keyboardist Michele Luppi and drummer Tommy Aldridge – will begin a 7-week US tour in Newkirk, OK on April 12. 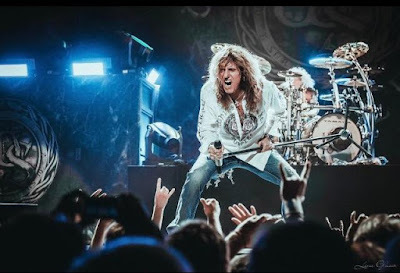 A Whitesnake fan club presale starts Wednesday, November 14 at 10 am local time (password fandb), with general public ticket on sale dates varying by city, with some starting Friday, November 16 – for full details by event, visit whitesnake.com. The US concerts will be followed a previously-announced series of UK and European dates that will start with an appearance at the UK’s Download Festival on June 14. Whitesnake recently released “Unzipped”, a collection of rare and unreleased acoustic performances recorded over the past two decades.